Pro Tools HD software offers an unparalleled breadth of options for creating in a professional music or post production environment. Easily import audio and MIDI files and loops for rapid song construction. Take advantage of an unmatched range of unique, non-destructive editing tools for groove creation, dialog replacement, Foley, and more. Choose among a wide-range of instrument and effects plug-ins for creative song development and sound design. Even experiment freely with different arrangements on the fly — all non-destructively. Pro Tools HD software offers superior features and functionality for the recording phase of production. Start tracking in virtually no time thanks to recallable custom mixer templates. Easily provide individual cue mixes for each performer in the recording session. With high-performance, 192 kHz–capable Pro Tools|HD audio interfaces boasting some of the best sonic specifications in the industry, you'll be guaranteed superb sound quality recording into the system. Pro Tools HD software offers the ultimate in mixing power and flexibility. Develop hit songs or mix massive film projects using the power of the most sophisticated dedicated DSP hardware and the added processing power of the computer. Utilize the very best third-party effects plug-ins for classic studio processor emulation, room simulation, noise reduction, dialog processing, ADR, and more. Take advantage of the most powerful automation in the industry. Choose a format, from mono to 7.1 surround — or mix in multiple formats simultaneously. Finally, use ICON to combine the familiar feel of a traditional mixing console with power and flexibility of the industry-standard digital audio workstation. When you work with Pro Tools HD software, you're working with the standard for professional music and post production. Enjoy full compatibility with countless Pro Tools–equipped studios and facilities around the world. Easily exchange entire sessions or individual session elements with others working on a project. Take advantage of an unprecedented level of interoperability with Avid workstations. Deliver projects in nearly any standard format with ease via Pro Tools software's advanced integration with DigiDelivery — the new standard in secure global file transfer. * One can now successfully import duplicate tracks to a Pro Tools 8.1 session without encountering an error. * Application failed to launch on OS X systems configured for Network Home Directories (i.e. Open Directory). In 8.1 (and 8.0.4), launching Pro Tools on a user account resulted in an assertion error when loading plug-ins, whereas in 8.0.3, Pro Tools crashed with "Pro Tools has unexpectedly quit" dialog. * Pro Tools may crash with "Floating point exception in thread MainThread at address 0x0" or similar errors when importing Aux tracks from another session. DigiTest updated to be compatible with SYNC HD Revision H and higher. * SYNC HD units with Rev H serial numbers (and higher) require a newer firmware that is included in this update of DigiTest. * Units will be delivered pre-programmed with the correct firmware version. However, if there is ever a need to update the firmware users should use this version of DigiTest (or higher). * The DigiTest version included with this update is also compatible with SYNC HD units with pre Rev H serial numbers. This latest update offers performance enhancements and fixes, plus new support for the Pro Tools HD Series interfaces—HD I/O, HD OMNI, and HD MADI. It also adds software support for HEAT (Harmonically Enhanced Algorithm Technology), a new Pro Tools HD software add-on for adding analog warmth and color to your mix. * With an ICON D-Command connected, some sessions could crash on open with a "Segmentation Fault" error. This issue did not affect ICON D-Control. * Previously, when changing users on a shared storage system (such as Avid Unity ISIS), Pro Tools would not update its user access privileges for workspaces until Pro Tools was relaunched. Thus, a user who should have read/write permissions on a given workspace may have read only access. This has been resolved. * Occurred if the file path to the plug-ins (system drive name and/or sub-folders) exceeded 31 characters. * In certain scenarios, control surfaces with scribble strips would flash a false "Dialog On Screen" message. * In some cases, sessions that opened properly in Pro Tools 7.4.x would open in Pro Tools 8 (on a system with the same amount of DSP) with plug-ins deactivated. * When recording video with Avid Mojo or Mojo SDI, the video record pass stopped prematurely if pre roll was enabled. The record pass would stop early by roughly the amount of the pre roll. * With MachineControl enabled and Transport = Machine, Pro Tools would display the message, "Error Cueing Machine" when attempting to preview audio via the File>Import dialog, Regions List, or via the Workspace Browser. * When trying to enable the Axiom Pro with Pro Tools 8 running in Simplified Chinese, Traditional Chinese, or Korean languages, Pro Tools would crash. * Scrubbing while Pro Tools is slaving to incoming LTC could cause Pro Tools to freeze or post an Assertion error. * The JL Cooper CS-10 control surface was not recognized by Pro Tools 8. * Attempting to view Send Mute automation view by selecting Cmd + Ctrl + Sends Mute on D-Control or D-Command displays the Rename dialog instead of Send Mute automation. * This could occur in some circumstances on Pro Tools|HD systems running TDM plug-ins if Use DSP Cache was enabled in the System Usage window. * Recording video with pre-roll enabled will cause audio and video to be offset by the pre-roll amount when playing back. * When using the DSP Cache feature and opening sessions with automated plug-ins, certain sessions will not restore the saved plug-in settings correctly. * When using Satellite Link, a Sync I/O connected to one of the networked Pro Tools systems may intermittently fail to generate time code. * This would occur on Satellite systems that did not initiate playback. This error has been removed. If Satellite systems are encountering problems while linking, please contact Technical Support. * Cannot browse Unity Medianet or ISIS workspaces in DigiBase. The following error message is shown repeatedly: "Assertion in "/Volumes/Development/vb_link/AlturaPorts/Fic/MacBuild/../Source/DiskScheduler/Volume/CDiskVolumeMacOS9.cpp", line 214"
* When sending a sequence containing a group clip to Pro Tools and then back to Media Composer via Avid Interplay with Replace Tracks, the following error message is displayed in Media Composer: "Exception: Sequence refers to non-existent track in clip. Please turn off monitoring and re-edit reference to the following clip. You may then re-enable monitoring [clip name]." * When assigning sends to a bus sub-path and using the "follow main pan" function, send pan automation may get stuck and not play back dynamically. * Sessions containing many video regions may cause audio file import to take a long time. This affects importing from DigiBase or via drag and drop from the desktop and may cause delays of up to 10 seconds per file. * Pro Tools systems with cards installed into the Digidesign Expansion|HD chassis may experience -12001, -9161, or -1140 errors indicating a loss of communication with the Expansion|HD chassis. A restart is required. * When chasing time code and simultaneously playing back Avid video via Mojo or Mojo SDI hardware, setting pre-roll in Pro Tools will cause picture to be offset by the pre-roll amount. Additionally, video playback will stop before the end of the video clip. * Logic Pro 8.x will unexpectedly quit when attempting to record audio via Pro Tools hardware and DAE. * When using Pro Tools 8.0cs1 or higher with Satellite Link or Video Satellite LE, all connected satellite systems must be running Pro Tools 8.0cs1 or higher. * When using Media Composer-based Video Satellite with Pro Tools 8.0cs1 or higher, you must run Avid Media Composer 3.1.2 or higher. * Pro Tools 8.0 cannot be connected as a satellite to other systems running Pro Tools 8.0cs1 or higher, or Media Composer 3.1.2 or higher. Sporting a sleek new look and enhanced functionality and interactivity, Pro Tools 8 is easier to use than ever, faster to work with, and offers more customizability to satisfy your needs. Pro Tools 8 comes fully packed with over 70 groundbreaking virtual instruments, effects, and utility plug-ins, and over 8 GB of audio loops to jump-start your creativity. The new Score Editor lets you view, edit, arrange, and print MIDI data as music notation, allowing you to compose music using the notation tools or transcribe MIDI data in real time. The all-new MIDI Editor window in Pro Tools 8 takes sequencing with Pro Tools to a whole new level, boasting a comprehensive array of new MIDI editing features, tools, and functionality that make it easier than ever to compose with virtual instruments and sound modules. Effortlessly transpose a region to a different key or fix its pitch in real time with the new Elastic Pitch, the perfect complement to Elastic Time. Capturing a flawless performance in a single take is often a rarity; with the new track compositing workflows, you can craft the perfect performance from multiple takes faster and easier than ever. Pro Tools 8 deepens its ICON console, Digidesign® control surface, and M-Audio® peripheral integration, letting you map plug-ins directly to your controller and more. Pro Tools HD® 8 expands the capabilities of Pro Tools|HD audio hardware with new options that allow you to sync with HD/SD video playback systems or even multiple Pro Tools|HD systems. Although set to "yes" there was no value readout when touching faders. Please Note: In order for this fix to take affect, the Pro Tools HD v7.4 Preferences file (located here: User Name > Library > Preferences) will need to be deleted before launching the updated Pro Tools HD 7.4cs7 application. Expand To New Tracks By Time Code Only capability lets you expand a track or selected region to new tracks, revealing all other regions recorded at the same time code location, regardless of channel name or number. In previous versions, other metadata needed to match in addition to time code for this feature to work. The following error is generated when selecting a 256 + comment in the Workspace: "The value contained too many characters; previous value substituted". Please Note: In order for this fix to take affect, the Pro Tools HD v7.4.2 Preferences file (located here: User Name > Library > Preferences) will need to be deleted before launching the updated Pro Tools HD 7.4.2cs1 application. A fader position in Latch/Trim or Touch Trim could be accidentally bumped while the transport was stopped. Pro Tools® 7.4.2 software provides Mac OS X 10.5.3 Leopard compatibility to Pro Tools 7.4 HD, LE, and M-Powered owners. 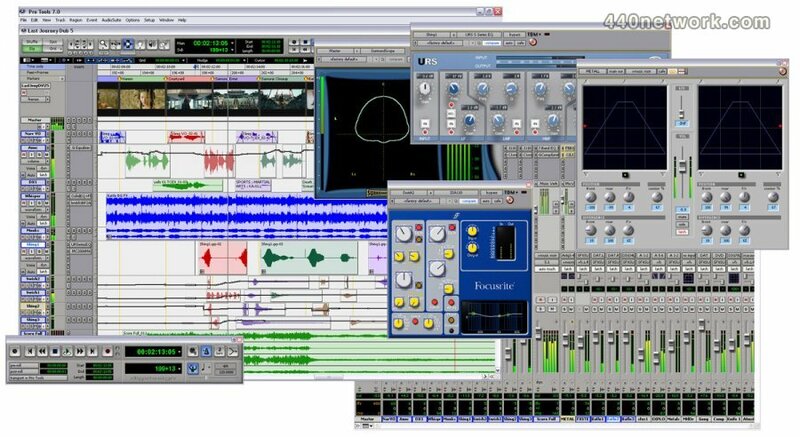 Pro Tools 7.4.2 software requires Mac OS X 10.5.3. If you have an earlier version of Leopard, you will need to update your Mac OS using the Mac OS X 10.5.3 Combo Update before installing Pro Tools 7.4.2. The new Expand To New Tracks By Time Code Only feature lets you expand a track or selected region to new tracks, revealing all other regions recorded at the same time code location, regardless of channel name or number. This feature is useful when expanding edited guide tracks to original source audio which was recorded while referenced to time code, but channel names or numbers were not written to the audio files. For example, when a live concert is recorded in Pro Tools, then a guide audio track is edited along with the video, then the edited guide track is returned to Pro Tools and needs to be expanded to the original source tracks for mixing. Pro Tools HD 7.4.1 software provides Mac OS X 10.5.1 compatibility with Apple's current 8-core Mac Pro computers (those featuring Intel "Harpertown" processors). Pro Tools HD 7.4.1 software works with Mac OS X 10.5.1 only, and is NOT compatible with Apple's new Mac OS X 10.5.2 release. Please do not update your OS until we've made an official announcement about compatibility. Leopard compatibility for Pro Tools LE®, Pro Tools M-Powered , other Pro Tools|HD systems, older Intel-based Mac Pro computers, Avid Mojo® SDI, and expansion chassis is expected in subsequent Pro Tools software updates, so please wait until official announcements are made before upgrading your system to Mac OS X 10.5. Please note that there is still an outstanding issue where Surround Pan automation may stick on a particular output. Digidesign is currently working on a solution. Under certain conditions the Back and Play command would not respond when transport was set to Transport = Machine. The workaround was to shuffle paths in the I/O Setup, use another bus path, or reopen the session. In some cases, having to force quit after getting Neo Assertion errors could cause all regions to be removed from a session. Although this could occur while editing or recording over regions, the problem was most evident when QuickPunching over existing regions. After the play command, the Play and Stop buttons flash, but Pro Tools does not play. This would occur if the previewed audio was the result of a search. Note that clicking on the waveform was not problematic. This could occur if the fader was moved without receiving a "touch on" and then touched properly. Please Note: After installing Pro Tools 7.3.1cs2, the user must un-declare, then re-declare the ICON main units and fader packs to prompt the firmware update dialog. If the ICON firmware is not updated, the fix will not be installed. This would occur if no automation had been written on the Send. As long as the session remained open, it would still playback correctly and with all playlists intact. The problem would not be observed until the session was closed and reopened. Any AutoBackup files created would have the same problem when subsequently opened. If the bounce duration exceeded the length of the video clip, the resulting movie would be stretched to fit the selection, resulting in a time-stretched picture. Note - this occurs when using "insert" mode in the MachineControl track arming window. The problem would only happen when a conversion was required or forced. The problem would not happen when using the "Import Audio" dialog to import/convert the file. A problem with file name suffixes could cause a second video record pass to replace the first one after the session was reopened. This would happen after recording to a "Save As," "Save A Copy" or to video tracks that had been imported to a new session, and then saving, closing, and reopening that session. This could occur when immediately moving the mouse/trackball after unclicking. "Auto-Write On Stop" mode (to start, to all/selection, to end) would affect any automation write, even if it had been automatched out. This bug would not occur if the audio had valid soundroll timestamps in the Avid source bin. This bug would prevent the automatic matching features of field recorder workflows in Pro Tools. When the OMF file had been set to "Read only" on Windows or "locked" on Mac, every region played the same audio data. Attempting to re-import the OMF after the session was opened resulted in a message, "Some regions were truncated or removed from the region list or timeline because they referred to files which are too short." Pro Tools HD 7.2.1 is a compatibility update of Pro Tools HD 7.2 software that provides support for the new Intel-based Mac Pro, released by Apple on August 7th, 2006. From new VCA-style groups to pan grouping and plug-in parameter linking, Pro Tools HD 7.2 software is loaded with indispensable new features dedicated to improving your mixing workflow. New automation modes combine advanced features previously found only on high-end consoles with the power of Pro Tools, to deliver the most comprehensive and flexible automation system in the industry. And with additional new functionality designed to enhance operation with ICON worksurfaces—including VCA fader spill, two-knob surround panning, new jog wheel scrolling/zooming, and much more—Pro Tools HD 7.2 software provides music and post professionals with the best mixing tools on the market. Pro Tools HD 7.2 software allows you to work with integrated video with the same renowned simplicity and elegance that has made Pro Tools the industry-standard digital audio workstation. Cut video along with audio using standard editing commands, create multiple video tracks and playlists within a single session, and bounce edited QuickTime or Avid video with audio as a QuickTime movie for fast review and approval. Pro Tools|HD 7.2 software also provides frame edge-aligned playback of all common QuickTime resolutions—including H.264—through Avid Mojo or AVoption|V10. Most location sound today is captured on multi-channel disk-based field recorders, so replacing guide track audio with alternate source material in post has become commonplace. It is often time consuming and tedious. With enhanced metadata features including iXML support and new multi-channel matching functionality, Pro Tools HD 7.2 software dramatically simplifies this process for dialog editors. Switching to alternate channels becomes as simple as right-clicking on an audio region or selection: pick a channel by name and Pro Tools instantly creates a new region and rebuilds the crossfades. Pro Tools HD 7.2 software transforms your Pro Tools|HD rig into a full-fledged, standalone dubber. The new DestructivePunch record mode allows for seamless punching into a contiguous "flat" file for each recorded track so you won't have to consolidate file fragments at the end of a session. With support for third-party paddle controllers, Pro Tools can easily replace aging standalone hardware dubber/stem recorders while giving you the benefit of a single, adaptable software environment. Pro Tools HD 7.2 software now includes the new SignalTools suite of multi-channel metering and analysis tools, available in TDM and RTAS formats as part of the free DigiRack collection of Pro Tools plug-ins. SignalTools features a completely redesigned SurroundScope level metering tool, which boasts a simplified user interface, precision metering in a variety of international standards, plus Leq(A) measurement. You also get PhaseScope, an invaluable tool for visualizing phase relationships in stereo tracks or between any two streams in multi-channel audio. Pro Tools HD 7.2 software introduces a new suite of menus and commands that are available through right-click mouse operation. Many edit commands and functions such as renaming paths without opening the I/O Setup are presented when objects are right-clicked in the User Interface. Fades can now be treated like audio regions and nudged or slipped independently from their parent region. This makes it possible to get the fade in the perfect place without trimming; crossfades can be split into fade-ins and fade-outs with a single command. DVD, CD, and hard drive volumes with Japanese naming will not mount in DigiBase. It was also not possible to create a Pro Tools session on a Japanese-named volume without getting an error. Messages included Communication errors and DAE -1140/-9161 errors. For this bug to occur, it was necessary to destructive record, save, close, and reopen the session, then destructive record/append to the same file. If DigiTranslator was not installed, Pro Tools would assign a new unique ID to a copy of an Avid audio file when using "Save A Copy." This was because Pro Tools required DigiTranslator to read Avid unique IDs. Automatically add a unique ID (as needed) to audio files when opening a session or importing audio. Recognize Avid unique IDs, even when DigiTranslator is not installed. This could occur when touching a control immediately after a "play" command, but before the transport started moving. This problem was exacerbated by the use of RTAS reverbs on Aux tracks. This problem occurred in Pro Tools 7.1cs7 and 7.1cs8. Network Home Directories are sometimes used to provide the same settings and files to users on multiple machines on a network. This fix allows the Library/Preferences Directories to be on a Network Home Directory instead of being required to be on the individual local system. German, Norwegian, Swedish, and French/French Canadian characters were affected. DigiBase search criteria was also affected. This would occur when the Machine Follows Edit Insertion/Scrub preference was enabled. Pro Tools would not allow a session with a 2-hour start time to overlay automation data on a session with a 1 hour start time without clearing all automation before 2 hours on the destination session. Automation cannot be "combined" with an overlay—the destination session's automation will be replaced from the Session Start time of the source session. This could occur with high track count sessions when using the surround mixer. This could stop another 9-pin device in the system unnecessarily. This change in behavior is activated only by the "Non-Linear Transport Error Suppression" preference. The error posted was "Could not complete your request because Assertion in Cmn_Interval.cpp, line 210." These errors could occur when performing "snapshot" automation changes across some or all parameters. Pro Tools HD 7.1cs7 will only update the ReVibe plug-in if a previous installation of ReVibe is detected. Error messages included "Waiting for Sync" or "Error Cueing Machine" when Pro Tools was controlling a non-linear video deck or a synchronizer. A new preference has been added in the Machine Control preference pane for these configurations – "Non-linear Transport Error Suppression." Select this option to suppress these error messages. When recording multiple tracks, files could be recorded out of sync with each other unless the Delay Compensation state had first been toggled on/off, or off/on. When a file was renamed from the region list (using the menu command or double-clicking), the file suffixes would incorrectly change in both the timeline and the region list, but the file order would remain correct. Instead of renaming the audio files in the standard film format (L, C, R, Ls, Rs, LFE) the files were renamed as C, L, Rs, Ls, LFE, R.
If you then dragged a renamed file to the timeline, the suffixes would appear to be in order, but the files would be in the incorrect order. This did not occur when renaming regions from the Timeline (or Playlist) by double-clicking with the grabber tool. Copying from these fields was not possible if there was a time selection on a playlist or the timeline. This could also potentially affect some third party post applications that required the use of these fields. Fixes a problem where if an on-screen play selection is created, and tempo is adjusted during playback, the selection area would stay the same length in samples (instead of musical time) and would not update to match the tempo. This affected mTools, NetMix, some versions of Soundminer, and customers who used Apple Events to import audio into Pro Tools. The fix requires removing the capability of auditioning audio files by dropping them on the Pro Tools application icon. This occurred when 2 or more processors were RTAS-enabled. After an initially successful AAF/MXF import, reopening the session or previewing MXF audio files from Digibase could result in file corruption. This would happen with a file name longer than 26 characters, as this could result in a file with more than 31 characters. This would happen when attempting to bring up the Fades dialog if there was no underlying data to make the crossfade. Fade commands that do not bring up the Fades dialog would not cause the problem. This could result in the recorded audio being shifted early incorrectly. Note that the same plug-ins on Auxiliary Inputs or audio tracks reported the proper amount of 0 samples and therefore did not exhibit this problem. Even though Pro Tools would continue to function properly after an aborted firmware upgrade, the user would be reminded to update the firmware each time they declared D-Control in the Peripherals dialog. This could happen when performing a bounded destructive record. In "Write" mode, breakpoints were not being created on "start" and "stop," and also, when performing a "write to end" if no previous breakpoints existed on the playlist. With a send assigned, banking the control surface could result in an "unexpected quit." Previewing a crossfade or auditioning an existing crossfade in the Fades dialog results in clicks or no audio. When using Groove Quantize as an edit operation or as Input Quantize, notes were being randomly moved. This could occur when playback settings were changed, including the choice when opening a session to use the saved playback engine. When recording using pre-roll, incorrect audio might be played back during the pre-roll period (only with Expansion|HD). If an actual hardware problem existed (i.e. bad DSP), launching Pro Tools or Media Station could result in the reporting of a low memory condition, rather than reporting the failure to initialize the DSP hardware. The "fine-tune breakpoint" Command key functionality has now been restored to the pre-Pro Tools 6.9 behavior. The key command for "Write Level Constrained to Next Breakpoint" (new to 6.9) has been changed from "Command-click" to "Option-Shift-click." The key command for "Write Level Constrained to Previous Breakpoint" remains "Command-Option-click." The Tascam DA-98's servo lock bit behavior would cause Pro Tools to think the DA-98 was servo locked before it actually was. This would cause inconsistency when Pro Tools locked to serial timecode generated from a DA-98 or other devices with this same servo lock bit behavior. This behavior is specific to the SSL Axiom, and would result in the record state of Pro Tools being toggled until a "stop" command was issued by the SSL Axiom. This could happen more frequently after declaring an Edit Pack in the Peripherals dialog. QuickTime, Jam, Safari, iMovie and other applications were affected. While writing automation, a ProControl fader could lose communication with Pro Tools, resulting in no automation written for the time the lapse occurred. If you have a 192 I/O or 96 I/O, and the interface firmware version is 4.3, you need to run the DigiTest firmware updater. If your 192 I/O or 96 I/O has firmware version 3.0, incorrect input gain on legacy peripherals will not occur, and you will not be able to update the firmware. This does not apply to the 96i, which does not have a legacy port. The "fine-tune breakpoint" Command key functionality has now been restored to the pre-Pro Tools 6.9 behavior. The key command for "Write Level Constrained to Next Breakpoint" (new to 6.9) has been changed from "Command-click" to "Option-Shift-click." The key command for "Write Level Constrained to Previous Breakpoint" remains "Command-Optionclick". When using MachineControl with an External Time Code offset (in the fields labeled "Session Start Offsets" located in the Session Setup window), Pro Tools did not take the offset into account when performing an auto-edit on the 9-pin device. This was the case when using either the control surface jog wheel or the "Shuttle" Numeric Keypad Mode. QuickTime picture could stutter, and slow down when outputting audio via the Digidesign CoreAudio driver. Disk activity was too high during record passes, and could result in -9073 errors. The Pro Tools TDM 6.4 upgrade for registered Pro Tools|HD owners is $150 US. The upgrade can be ordered through the DigiStore: Upgrade kits will be available through Digidesign dealers starting in late April. * Pro Tools was not creating proper log files folder or log files to assist technical support with troubleshooting. * When exporting the same sequence more than once from Pro Tools back to Avid Interplay, Pro Tools could either hang, or the sequence would become corrupted. When the sequence is corrupted, Media Composer would post the following error when attempting to import or update the sequence, "A request for data from the asset manager is taking a long time to complete". * When checking into Interplay from Pro Tools using Replace Tracks, if the original sequence contained sub clips, the sub clips associations were broken. A master clip in Media Composer would show as a video only master clip, when there should be audio clips associated. Attempting to load a sub clip would post the error, "Track -1 not found". This has been resolved. * When chasing time code and simultaneously playing back Avid video via Mojo, Mojo SDI, or AVoption|V10 hardware, setting pre-roll in Pro Tools will cause picture to be offset by the pre-roll amount. Additionally, video playback will stop before the end of the video clip. Please Note: In order for this fix to take affect, the Pro Tools HD v7.4 Preferences file (located here: C:\Documents and Settings\UserName\Application Data\Digidesign) will need to be deleted before launching the updated Pro Tools HD 7.4cs7 application. The "constrain" command (Win+Trimmer) would not work under certain editing situations involving overlap/underlap. German, Norwegian, Swedish, and French/French Canadian characters were affected. DigiBase search criteria was also affected. This would occur when the preference "Machine Follows Edit Insertion/Scrub" was checked. without clearing all automation before 2 hours on the destination session. Pro Tools, HD, LE and M-Powered owners that are not using a control surface with Pro Tools can skip this update. 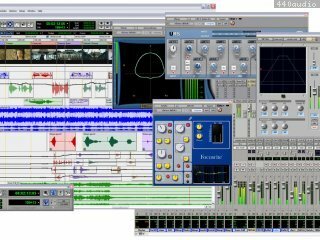 Le meilleur logiciel pour le montage audio, le mixage, les traitements et le son à l'image. Manque plus que deux, trois fonctions MIDI pour faire de lui un champion toutes catégories.